The 81-year-old Mahmoud Abbas, who took over as leader of the Palestinian Authority (PA) in January 2005, after the death of Yassir Arafat, was overwhelming reelected as leader of Fatah/PA, which governs the West Bank, on Tuesday, after ruthlessly shutting out his principal opponent, 55-year-old Mohammed Dahlan, and Dahlan's supporters. Abbas's victory isn't a surprise, but it wasn't the outcome that the so-call "Arab quartet" -- United Arab Emirates (UAE), Egypt, Saudi Arabia and Jordan -- had hoped for. Much of the Arab world has been waiting for Abbas to retire or die, so that a younger leader like Dahlan could replace him. Abbas, born in 1935, is part of the old generation of survivors of the genocidal war between Jews and Arabs that followed the 1947 partitioning of Palestine and the creation of the state of Israel. When Yasser Arafat died in December 2004, Abbas was a natural choice to succeed him, because they were both war survivors and shared a common world view. But now the time is approaching for a successor and for a generational change. The major aspirant is 55 year old Mohammed Dahlan. Dahlan grew up poor in a Gaza refugee camp, but as a top aide to Arafat became Gaza's strongman in the 1990s, jailing leaders of rival Hamas which was trying to derail Arafat’s negotiation with Israel through bombing and shooting attacks. Abbas and Dahlan used to be allies, but the 2008 war between Fatah and Hamas, that made Hamas the governing power in Gaza caused tension between them, until 2011 when Abbas expelled Dahlan completely from Fatah. The population of the West Bank is badly split between supporters of Abbas and Dahlan. Abbas, as a survivor of the bloody 1947-48 war, has devoted much of his life to achieving some kind of political solution to the conflict with Israel -- namely the so-called "two-state solution" with Israel and Palestine existing side by side in peace -- a "solution" that can only be described as delusional. 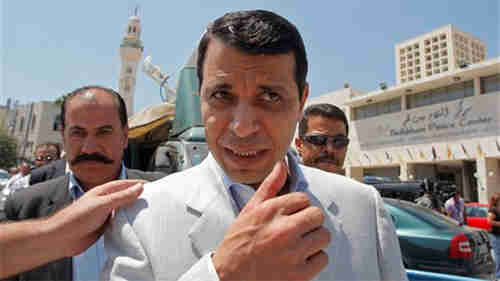 Supporters of Dahlan are generally much more belligerent, and are ready to go to war with Israel. Dahlan and his supporters are in the generations that grew up after the 1947-48, and have no personal memory of its horrors, and so is not afraid to see that war repeated. The youngest generations of Palestinians, as far as I can tell, are pretty much disgusted with all the Palestinian leadership. This is the so-called "Oslo generation," kids growing up after the 1993 Oslo accords that were supposed to bring peace to the Mideast, but in fact are perceived as having accomplished nothing. They see the so-called "Mideast peace process" as nothing more than a failed series of humiliations for Palestinians. Ever since Hamas's stunning victory of Fatah/Palestinian Authority in 2006, which permitted Hamas to eject Fatah from Gaza, the two governments have seemed to hate each other more than they hate Israel. There have been several attempts to form a "unity government" between the two entities. The most recent attempt followed the 31-day Gaza war between Israel and Hamas, which Israel won. After the war, there was enormous pressure from Arab states for Hamas and Fatah to unify into a single government. The United Nations General Assembly had created the nation "Palestine" in 2012, but it didn't make sense to have a state of Palestine, if the Palestinians had two separate governments in conflict with each other. They did form a unity government in June 2014, but it was unity in name only. They never did function as a single government, and Abbas dissolved it in June 2015 over a disagreement about money. The wager on the diplomatic movement on its own has been proven a failure. Let us agree on a national strategy and that everyone is with the [armed] resistance, which is a legitimate right that raises the cost of the occupation." The last sentence affirms that Hamas expects to continuing using violence against Israel, to end Israel's "occupation" of land in the Mideast and Israel's existence.